You can create new buttons by right clicking on an empty part of the toolbar and selecting "Add Button" from the popup menu. You can modify or delete a button by right clicking on it. A dialog will open to let you define the button label, tab title, command, and startup directory. 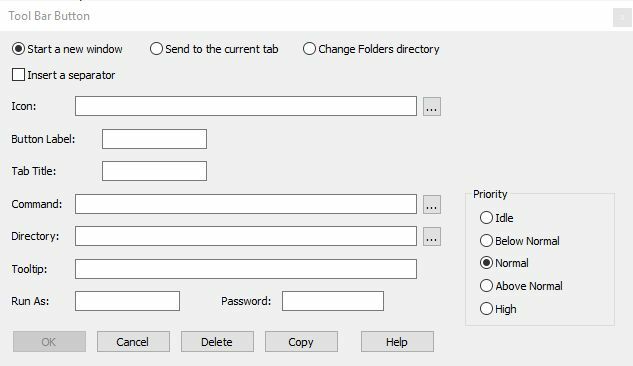 A toolbar button can either open a new tab, send keystrokes to the current tab, or change the directory displayed in the File Explorer window. You can define a toolbar button to display either an icon, a text label, or both. You must specify either the Icon or Label fields. If you enter both, Take Command will display the text to the right of the icon on the button. In the Icon field, enter the filename for the icon (.ico) that you want to display on the button. If you specify an .exe filename, Take Command will use the first icon in that file. You can use the Browse button to find the file. In the Button Label field, enter the text that you want to display on the button. In the Tab Title field, enter the text that you want to display on the tab window title. This field is optional, and is only used when creating a new tab window. If you're starting a new window, the Directory field will set the startup directory for the command. If you are changing the Folders directory, the Directory field specifies the new directory. You can use the Browse button to find the directory. The command and directory fields can include environment variables and TCC internal variables and variable functions. Note that the variable expansion occurs in Take Command, not TCC, so internal variables like %_cwd will not probably work as expected. Characters entered within double quotes, e.g., "abc" will be sent to the active console application as is. The only items allowed outside the quotes are key names, the ! and /W options, and a repeat count. If keyname is a number, it is interpreted as an ASCII character value. The repeat count works only with an individual keyname. It cannot be used with quoted strings. You must have a blank space between the keyname and the repetition count. If you exit by choosing the OK button, any changes you have made will be saved in TCMD.INI, and reloaded automatically the next time you start Take Command. If you use the Cancel button, your changes will be discarded. The tool bar can also be configured with the TCTOOLBAR command.